Cast members, including several UNO alumni, perform Shakespeare's "King Lear" for a crowd at the annual Shakespeare on the Green event held each summer in Elmwood Park. When the company isn't performing for audiences in Omaha, they are traveling the state to bring their plays to schools and community events throughout the year. To some, Shakespeare’s works can be intimidating pieces of literature — difficult to understand; hard to connect with; out of date. Watching one performance by actors from Nebraska Shakespeare, though, has opened doors to a world of Shakespeare many never knew existed. “Shakespeare shouldn’t exist on a page, it should exist in a performance,” says Suzanne Withem, a company manager with Nebraska Shakespeare. A UNO theatre graduate and digital learning coordinator at UNO, Withem is part of Nebraska Shakespeare’s leadership team composed almost exclusively of UNO alumni. That includes Vincent Carlson-Brown (artistic director), Sarah Carlson-Brown (director of education) and Wesley Houston (director of production). 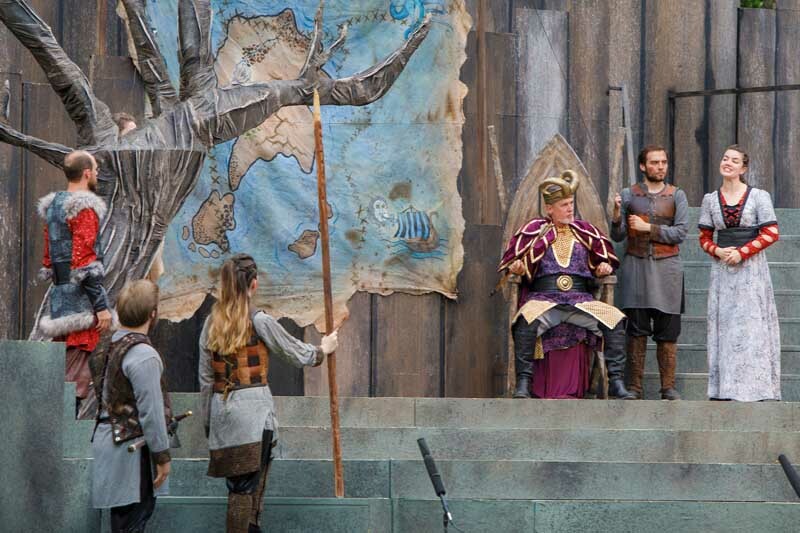 Nebraska Shakespeare helps shape the way people across Nebraska think about and experience the Bard of Avon. That’s done most notably through its flagship event, Shakespeare on the Green, which takes place in Omaha’s Elmwood Park every summer. Performances are free, but not everyone can make the trip to Omaha. Thirteen years ago, Nebraska Shakespeare addressed that issue by launching a travelling program, Shakespeare in American Communities, funded by a grant from the National Endowment for the Arts. Each year in September and October, Nebraska Shakespeare takes a team of nine actors into middle schools and high schools throughout the state to perform a 75-minute adapted version of a Shakespeare play. Past visits have been made to Lincoln, Grand Island, Kearney, Valentine, Cozad, O’Neill and Gering. Withem admits it can be a tough sell — at first. “A lot of students and adults have a bad taste in their mouth from Shakespeare because they think it’s too fancy or they can’t understand it,” she says. However, it often only takes one performance for Nebraska Shakespeare to be asked back. The group often visits the same schools almost every year while also continuing to grow its footprint. Last year, it performed for more than 10,000 students across the state. Nebraska Shakespeare regularly makes adaptations to the music and wardrobe so the play is a little more contemporary, but many students are surprised when they hear that none of Shakespeare’s prose has been changed. The troupe also experiments with gender and show students that women can play men’s roles. Another challenge in having a successful season is hiring the right people. She has a reliable pipeline of talent coming from UNO Theatre. More than half of the touring actors last year were UNO graduates. Most UNO Theatre students cut their teeth by performing at Shakespeare on the Green. They build a relationship and trust with Nebraska Shakespeare staff, and by the time they graduate they’re ready to tour. It’s a long couple of weeks on the road. Actors drive themselves to each community. They put up and take down sets at each stop. They interact frequently with the crowd. One visit, Carlson-Brown recalls, included a talented, first-time actress performing an emotional scene from “Macbeth.” It was in front of a room full of rowdy middle schoolers, and Carlson-Brown thought the actress’ approach was going to be a little “too much” for kids that age. She could not have been more wrong. Once the actress began her monologue, the room fell silent. The students’ eyes and ears were completely focused on the performance. “It challenged them, and students don’t get offered that a lot because people don’t think they can handle it,” Carlson-Brown says.